(1) THIS JOB IS NOT THAT EASY! Nicholas Whyte is back with “The Adminstrator’s Worldcon – part 2 of my 2017 Hugo memories”. I almost didn’t make it to Worldcon 75. My taxi was 15 minutes late picking me up from home, and then encountered serious traffic en route to Zaventem airport. I was far too late to check my bag and brought it through security, where I almost came unstuck because of the Official Hugo Glue, which Dave McCarty had given me at Smofcon in December and I now needed to give back to him. (In fact we did not need it, as the artist who created the bases had engraved the winners’ plaques and attached them to the bases herself.) Five different security officials inspected the Official Hugo Glue Gun (which fortunately in Dutch is not a gun but a “lijmapparaat”, glue machine) before I was allowed to go on my way. The captain of my plane then scolded me, entirely fairly, for bringing “hand luggage” which was, in his words, “way too big”. But he did not throw me off, and I arrived in Helsinki. 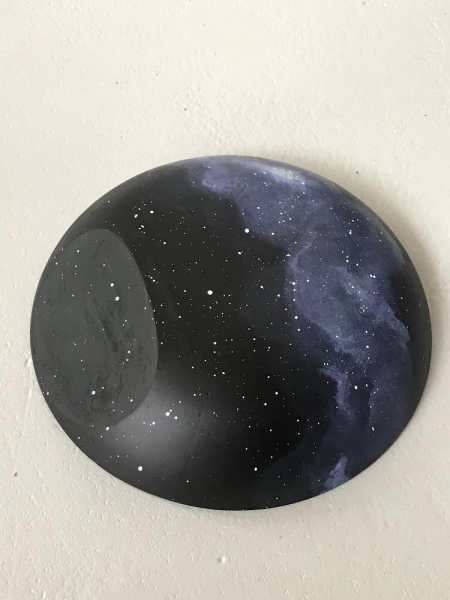 It turns out it was melted glue from where the felt was attached to the base (it’s hot here in Arkansas!). It’s been cleaned off with no problems and we’re looking into the proper type of glue to reattach the felt so disaster averted!! The bolt and washer were missing, too, but we’re going to pick a replacement up tomorrow. Nicholas Whyte from the Hugo team was super responsive. I’m also impressed everything arrived so fast. Those Worldcon 75 volunteers are ON IT. (3) HUGO WINNER. The speech Ada Palmer was too overwhelmed to read at the Hugos is posted at her blog: “Campbell Award & Invisible Disability”. Thank you very much. I have a speech here but I actually can’t see it. I can think of no higher honor than having a welcome like this to this community. This… we all work so hard on other worlds, on creating them, on reading them, and discussing them, and while we do so we’re also working equally hard on this world and making it the best world we possibly can. I have a list with me of people to thank, but I can’t read it. These tears are three quarters joy, but one quarter pain. This speech wasn’t supposed to be about invisible disability, but I’m afraid it really has to be now. I have been living with invisible disability for many years and… and there are very cruel people in the world for which reason I have been for more than ten years not public about this, and I’m terrified to be at this point, but at this point I have to. I also know that there are many many more kind and warm and wonderful people in this world who are part of the team and being excellent people, so, if anyone out there is living with disability or loves someone who has, please never let that make you give up doing what you want or working towards making life more good or making the world a more fabulous place. (4) CONREPORT. Cora Buhlert shares her Worldcon experience in a short video, Cora’s Adventures at WorldCon 75 in Helsinki. Includes a shot of one of the File 770 meetups. (5) CURBED ENTHUSIASM. Mark Ciocco weighs in on “Hugo Awards 2017: The Results”. The Obelisk Gate by N.K. Jemisin takes the rocket for Best Novel, making Jemisin just the third author to have back-to-back wins in this category (joining the ranks of Orson Scott Card and Lois McMaster Bujold). She’s a good author, but damn, these books are not for me. Both were at the bottom of my ballot and while I can see why her novel won last year, this one is a little more baffling. It appears to have been a close race though, with All the Birds in the Sky only narrowly missing the win. I regret not putting it higher on my ballot, as it’s the only non-series finalist, and that’s something that’s becoming more and more of an issue… My preferred Ninefox Gambit came in third in the voting, which wound up being a theme for my first ranked works this year…. (6) PHOTO FINISH. Amal El-Mohtar coincidentally provides another clear photo of the Hugo base. I read so much on vacation. This is everything I liked. I MISSED YOU! (9) ROWELL REUNITES RUNAWAYS. 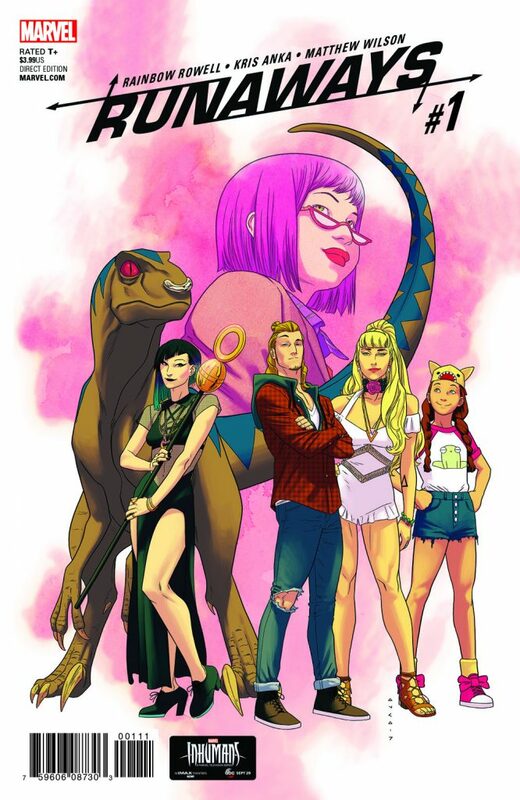 Marvel is bringing back Nico, Karolina, Molly, Chase, Old Lace and even Gert. 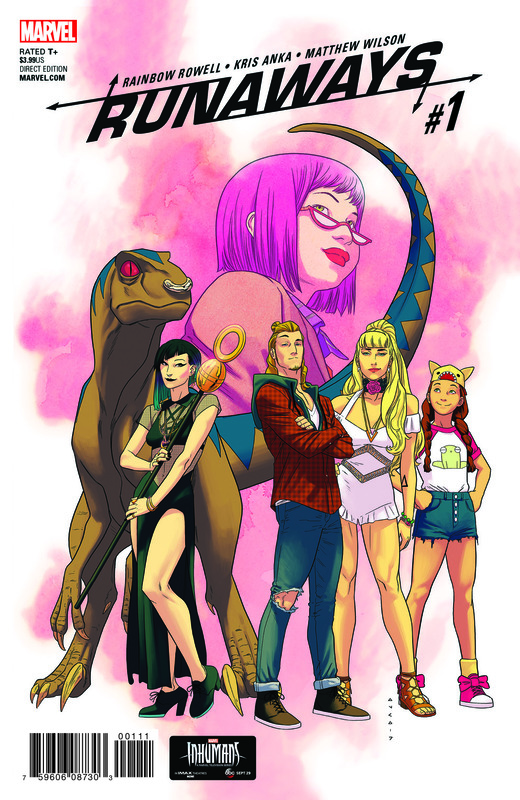 This fall, best-selling YA writer Rainbow Rowell (Carry On, Eleanor and Park), superstar artist Kris Anka (All-New X-Men, Star-Lord) and Eisner-winning colorist Matt Wilson (The Mighty Thor, Black Widow) team up to bring the universe’s pluckiest team of super heroes back to where they belong: in the pages of a Marvel comic book. Star Trek and Deep Space Nine writer Marc Scott Zicree shares the entire Captain Sulu Star Trek pilot he and Emmy winner Michael Reaves wrote, and shares the untold story of why you never got to see that series — despite its Hugo and Nebula Award nominations! August 18, 2001 — Stacy: Attack of the Schoolgirl Zombies premieres in Japan. COMICS SECTION. John King Tarpinian approves of the monkey business on Brevity. Publishers Weekly has a progress report on the litigation in “Still No Opinion, but Judge’s Order Bans Distribution of ‘Infringing’ KinderGuides”. Following a summary judgment ruling last month, a federal judge this week signed off on a permanent injunction immediately barring Moppet Books from distributing in the U.S. any versions of its KinderGuides series held to be infringing, until the works on which they are based enter the public domain. In addition, Moppet Books also agreed to destroy all current copies of the infringing works “in its possession or under its control” within 10 days. Don’t expect the shredders to fire up quite yet, however. While the ban on distribution is effective immediately, the injunction includes an automatic stay on the destruction of existing stock, pending the “final outcome” of the appeal process. …Meanwhile, despite the ongoing legal battle, Moppet Books is moving ahead with plans to launch a new line of books in October, including a collection of KinderGuides based on public domain works, and two original nonfiction works. (14) WHAT’S THAT, ROCKY? The New York Times, in “When Dinosaurs Ruled the Earth”, reports that new fossil discoveries show prehistoric “squirrels” glided through forests at least 160 million years ago. In a study published on Wednesday, a team of paleontologists added some particularly fascinating new creatures to the Mesozoic Menagerie. These mammals did not lurk in the shadows of dinosaurs. Instead, they glided far overhead, avoiding predatory dinosaurs on the ground — essentially flying squirrels of the Jurassic Period, from an extinct branch of mammals that probably still laid eggs. (15) BRADBURY DRAMATIZED. Broadway World says a one-man Bradbury play will be part of a stage festival in New York next month. Bill Oberst Jr. brings his award-winning solo performance, “Ray Bradbury‘s Pillar Of Fire,” one of Bradbury’s darkest tales, to Theatre Row on Sunday, Sept. 17 at 6:00pm. The NYC debut is part of the United Solo Theatre Festival. (16) OLD HOME WEEK. Andrew Porter used to live in part of the historic Henry Siegel mansion, whose story was chronicled in the Daytonian in Manhattan blog yesterday. …This is where I first published ALGOL, DEGLER! and then S.F. WEEKLY. It’s where I lived while I worked on the 1967 Worldcon, NYCon 3. I had numerous fan gatherings there, and have photos of Ted White and Arnie Katz in my room. 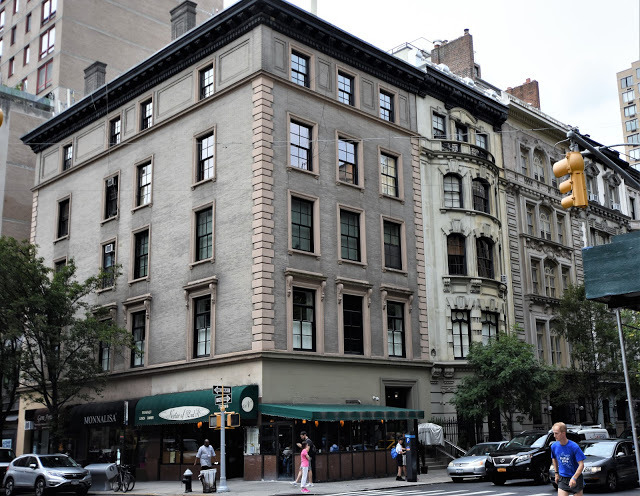 This block of East 82nd Street is also the direct approach to the Metropolitan Museum of Art, whose fabled entrance stairs are visible directly down at the end of the block. In later years, part of the basement housed a toy store accessed by a stairway from the bookstore above. The proprietor told me that some of the toy soldiers he sold came from the collection of Donald A. Wollheim, a well-known collector and once publisher of DAW Books. And one of the buyers was George R.R. Martin, whose “Game of Thrones” (HBO) is so popular. …For many years there was also a bookstore. In early 2017, Crawford Doyle Booksellers, which claimed to be there for 21 years, closed. However, there’d been a bookstore there since at least the late 1950s. I know, because as a teenager, I had a job delivering Womrath Library rental books to posh apartments around the area. (17) IN THE FLOW. The Hugo Award Book Club discusses John Scalzi’s latest novel in “Review: The Collapsing Empire”. Given John Scalzi’s track record, high profile, and vocal fan base, it seems likely that The Collapsing Empire will be given a fair amount of consideration on many 2018 Hugo nominators’ lists. Based on how fun this book is at times, that consideration is probably warranted. The novel is set in an interstellar empire tied together by limited faster-than-light traderoutes known as ‘the Flow.’ This empire — The Interdependency — has lasted for millennia because of the economic dependence of its member worlds to each other. The key protagonists are the new Empress of the Interdependency, and the son of a scientist on a distant world whose father has spent decades discovering that the flow is going to collapse. The overaching plot — which has some parallels to Asimov’s Foundation— is expertly constructed and well-paced. Although the characters all seemed to speak with a similar voice, their motivations were clear, and the conflicts felt natural. Solar power already comes with up and downs, in the form of clouds. “So this was a particularly cloudy day,” says Jan Klube of Enphase, pulling up a graph showing the solar output from one California home. The Petaluma-based company monitors rooftop solar systems around the country day in and day out. If your solar panels are in the path of totality during the eclipse, “it will go all the way to zero,” he says. California isn’t squarely in the path, but the moon’s partial shadow will obscure 90 percent of the sun in the north, down to nearly 60 percent in the south. That’s more than enough to cause some anxiety for the people who have to keep California’s lights on. (19) THE DARK SIDE. Scientists to study whether nature really goes crazy during an eclipse: “Will The Eclipse Make Crops And Animals Flip Out? Scientists Ask (Really)”. With the help of elementary school students, University of Missouri biology professor Candi Galen is putting out microphones near beehives, in gardens and in a pumpkin patch to record buzzing activity. Researchers are also working with nearby cattle ranchers and even fishermen to monitor fish activity, Reinbott says. (20) DNA EDITING. An NPR report is allowed to go “Inside The Lab Where Scientists Are Editing DNA In Human Embryos”. Critics, however, pounced on the news. They fear editing DNA in human embryos is unsafe, unnecessary and could open the door to “designer babies” and possibly someday to genetically enhanced people who are considered superior by society. As the debate raged last week, I asked Mitalipov if I could visit his lab to see the next round of his experiments. He wants to confirm his initial results and determine whether the method can be used to repair other mutations. He agreed to a visit, and on Monday, I became the first journalist to see these scientists cross a line that, until recently, had been taboo. The Defenders hits Netflix today, and with it comes a look at Marvel’s upcoming show The Punisher. Frank Castle was introduced in season 2 of Daredevil. He’s played by Jon Bernthal, who will reprise his role as the gun-toting Army vet out for revenge. (22) SAY HELLO. Amazon Prime video will stream The Tick on August 25. From creator Ben Edlund comes the hero you’ve been waiting for. In a world where heroes and villains have existed for decades, a mild-mannered accountant named Arthur has his life turned upside down when he runs into a mysterious blue superhero, The Tick, who insists that Arthur become the brains to his brawn in a crime-fighting duo. Will Arthur resist the call of Destiny or join the fight?